What It’s About: Drifter Frank Chambers (John Garfield) gets himself a job working at Nick Smith’s (Cecil Kellaway) gas station and roadside restaurant. The only trouble is Smith’s beautiful, younger wife Cora (Lana Turner). Frank and Cora begin an affair, then plan to murder Nick, but is any murder really “perfect”? Why Watch it Today? : Lana Turner, first famed as “the sweater girl” and later for tumultuous personal life, was born on this date in 1921. 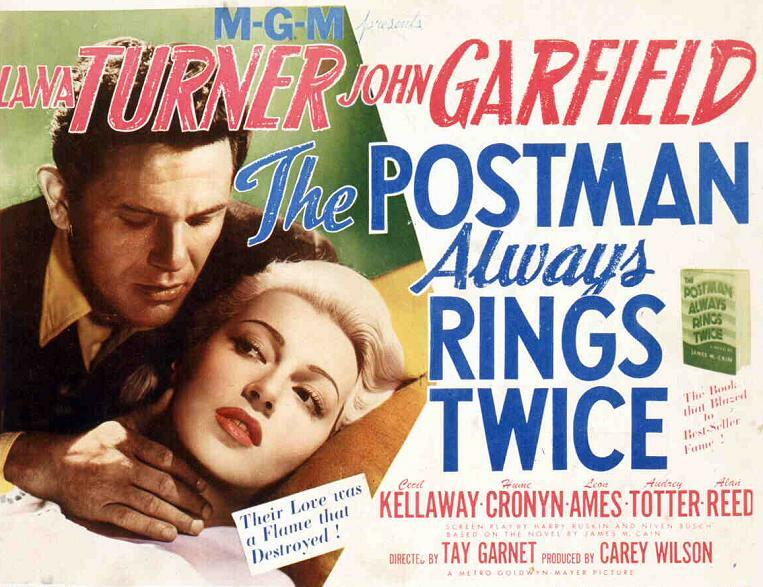 Turner is great in this noir classic, the first version of James M. Cain’s novel of the same name. This entry was posted in Adaptation, Based on a Book, Black and White, Crime, Drama, Film Noir, Movie of the Day, Romance, The Original, Thriller and tagged adultery, affair, alcoholic, Cecil Kellaway, courtroom scene, D.A., diner, double cross, drifter, hitchhiking, Hume Cronyn, James M. Cain, John Garfield, Lana Turner, Leon Ames, MGM, murder, roadhouse, twist.